Maranatha Baptist Church was begun with the military in mind, a few military families stationed on Okinawa in the 1960’s recognizing the need for a fundamental Baptist church. That desire was the seed for Maranatha’s creation, nurtured to reality with the arrival of a missionary couple, Bob and Marlyn Elzey in May 1968. Under the auspices of the Baptist International Missions, Inc., the Elzey family joined in worship services in the home of another missionary, Jim Kinnard, in the old Camp Boone housing area. The few families became many, and growth dictated a larger worship space on what was then Highway 1 (now Highway 58) in the Oyama area. Maranatha Baptist Church was formally established on the site in September 1968, a move followed by addition of another floor to the church building and rental of several houses nearby to handle the overflow Sunday School crowd. Jim Kennard became Maranatha’s official pastor, and led the ministry’s expansion and relocation to a larger building in 1976. He was followed in September 1978 by Ed Gibson, who handled pastoral duties for nearly 12 years while continuing Maranatha’s growth and expanded evangelistic outreach. 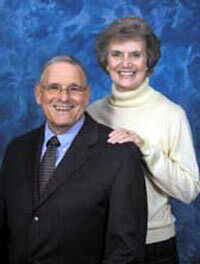 In January 1990, John Baltz became pastor, followed by Dan Mouw in 1993. Under his tutelage, Maranatha began the relocation and expansion to its current Chibana area location. The current pastor, Steve Nutt, stepped into the pulpit in August 2000, leading the church into its building project completion and ministry expansion across Okinawa. He says “God has used this Lighthouse to minister to the needs of tens of thousands of military personnel in Okinawa, with thousands being saved and baptized.” Nutt notes hundreds have surrendered to full time Christian service as a result of their experiences at Maranatha Baptist Church. The official 40th anniversary celebrations at Maranatha Baptist Church will take place September 7~14. Many of the former members and pastors will be returning to Okinawa from around the world to participate in the celebrations. Nutt says church members are making great plans for marking the anniversary.